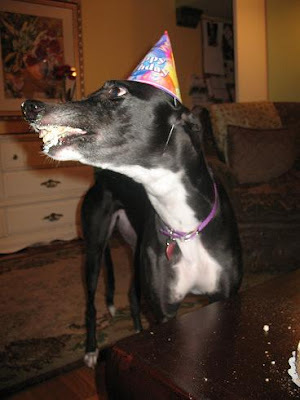 Greyhound Fairytales: Happy Gotcha Day, Annie! Interesting fact about Ana: She hates crates! (That is one of the reasons she looks so miserable!) 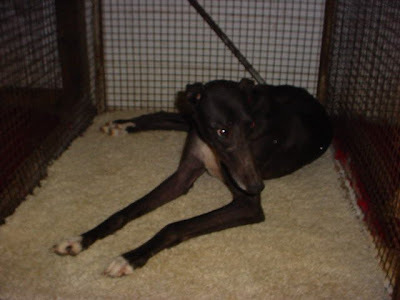 She was a crate puller at the track which caused her teeth to become extremely damaged and grooved from hooking her teeth on the crate wires and pulling. She is much happier in her fluffy king-size bed. The first time we met her was at the adoption. I can remember waiting outside for the van to pull up, anxiously awaiting our first greyhound. It was a day full of emotions- would she like us? would be be able to provide for her? will we break her...she looks so delicate! will she eat our cats? We were so worried, but as soon as the door to the van opened and all the greyhounds came tumbling out, it was love at first sight. Her stomach was weak (she vomitted flourescent green all over the white carpeting at the adoption house), and she had major runs from the stress of the trip and recent surgery (she "ran" all over my pants leg because I didn't realize she was having issues). But I remember how inquisitive she was- she would wander all over the house investigating all of the nooks and crannys. Anywhere you wouldn't think a dog would want to go, she went. I remember loading her into the Durango- she looked so confused! She stood there for a bit, wobbling on her feet, and then she realized that it wasn't a good idea to ride standing up. She laid down, and I remember looking over the seat at her as we were coming to a stop sign, and she had absolutely no instinct to prevent herself from slipping forward. By the time we drove the hour and a half back to the house, Ana was getting her car-legs. She spent the rest of the night sleeping on her fluffy dog bed, and we spent the rest of the night staring at her in wonder. The next few days, it was like having a new baby in the house (or what I imagine it to be like). Everything was an exploratory effort for her, and we could see her figuring out her new life. Annie in her new life (and new coat!). She is still such an inquisitive (and bossy!) puppy! 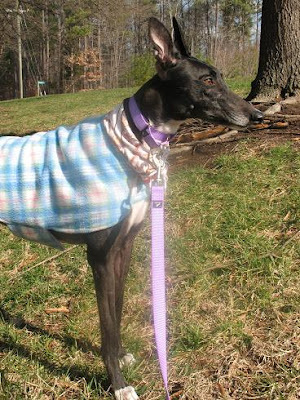 To see Ana today, you would never realize she was the same greyhound. At about the 6 month mark, it was like a switch was flipped inside her head. She cuddles with us in bed at night, even sharing my pillow with me. She plays with her stuffies like a crazy person, and she just knows she is entitled to the best treatment and treats that are available. She is sassy and sweet, and she is our little princess. Happy Gotcha Day, my sweet girl! I can't believe it has been a year already, but we just love having you as a part of our family and can't imagine a day without you! and I am glad you got her too..now I have two great friends!! !